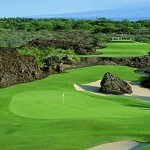 Mauna Lani Resort’s Francis H. I`i Brown North Course is characterized by rolling fairways and kiawe (mesquite) forests, which often come into play. Also a masterpiece of design, the North Course is a bit more difficult than the South and features a par-3 (No. 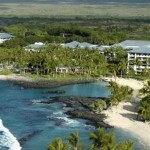 17) tucked into a natural lava amphitheater and a 230-acre protected archaeological district at its northern boundary. Robin Nelson designed course. 18 holes. Par 72. 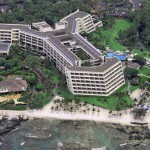 Home to the Senior Skins Games from 1990-2000, the Francis H. I`i Brown South Course snakes through stark, rugged lava, offering a panorama of ocean and mountain views. 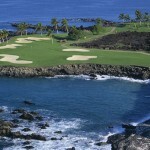 The South Course features one of the most photographed golf holes in the world, the dramatic, over-the-Pacific No. 15. Robin Nelson designed course. 18 holes. Par 72.